#1 Rule for Success : What is the Rule of Success? Do You Know the #1 Rule to Success? I’m sure most of you have at least heard about the #1 Rule for Success (or people talking about it), but the way SmarterComics describes it is dead on. Look back to something you were successful at and you’ll see that you more than likely followed this same mold to accomplish that goal. This entire thought process inspires me to keep going and chase after the sweetness of success. This concept reminds me of my two FAVORITE book’s “Think and Grow Rich” by Napoleon Hill and “Rich Dad, Poor Dad” by Robert Kiyosaki. If you haven’t read these books I highly recommend them, they will help open your mind to new thoughts of success you may have not had. 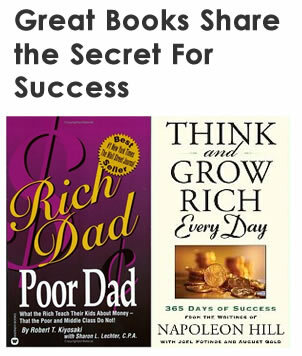 Rich Dad, Poor Dad is a very powerful book and contrary to what the title says, is not actually about a Poor Dad. It’s a true story about Robert Kiyosaki’s life to being a multimillionaire starting with nothing. On one side he has is father who follows the guidelines that many follow and he ends up with a great paying job but is stuck with no growth. His other father, not really his father but his friends father, is super rich. His super rich father helped Robert break outside of the norm and open his eyes as to what he did differently than his actual father. Grab these books and you won’t be disappointed. Just have an open mind. Some people may think the thoughts are stupid in these books, but like Robert and his rich Dad explain, those who don’t get it never will! I hope this inspires you too! What is the #1 Rule for Success? It’s not about wealth, it’s not about style, it’s not even about formal education. While these factors don’t hurt, true success is never attained without heavy-duty persistence. Anybody who has achieved their dream has been through the fire first. There are no exceptions to this rule. Whatever your dream may be, wherever your talent lies, you will achieve it only by sticking to your belief in yourself and refusing to give up. Life will throw more obstacles in your way than you can possibly imagine. Your job is to keep plowing through them with a combination of willpower, desire, talent, and cooperation with others. People who lack the ability to keep on going simply don’t get what they want out of life. It’s an unfortunate, brutal truth, but a truth all the same. This doesn’t mean you should pursue something that you have no interest in. On the contrary: do what you love. Just be prepared to encounter resistance along the way. Persistence is about more than being stubborn; it’s about knowing at a deep level that you have something of value to offer to the world, and that you will succeed if you keep going. That’s why success is so very sweet.